Pre-set torque: 0.6 Nm-3.0 Nm (0.4 ft.lb.- 3.0 ft.lb. ), fixed pre-sets. Blade: Hexagonal, 4mm, reduced diameter tip. Distinctly audible and noticeable excess-load signal when the pre-set torque is reached. Wera torque-indicators have been factory pre-set to values recommended by leading carbide tool manufacturers. Torque indicators ensure safe and easy loosening of screw connections. Precision : 10 %. Multi-component Kraftform handle with hard and soft zones for fast working speeds and protecting the palm of the hand. 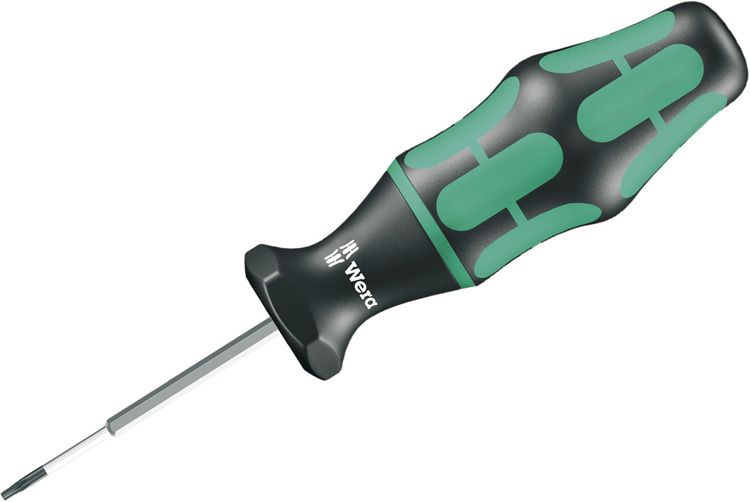 The 05027932001 Wera 300 TX Torx Torque-Indicator is one of thousands of quality tooling products available from MRO Tools. Please browse Wera Torque-Indicators, Sets for tools similar to the 05027932001 Wera 300 TX Torx Torque-Indicator. 05027932001 Wera 300 TX Torx Torque-Indicator description summary: Wera 300 TX Torx Torque-Indicator Point Size: TX 8 Pre-set Torque Value: 1.2Nm (0.9 ft.lb.) Hex Diameter: 4mm Shank Diameter: 3.5mm Shank Overall Length: 65mm / 2 9/16'' Handle Overall Length: 105mm Quantity discounts may be available for the 05027932001 Wera 300 TX Torx Torque-Indicator. Please contact MRO Tools for details.